So! I have some catching up to do! I was going to finish this post yesterday but I never made it out of bed. Needless to say, the welcome back / goodbye party went off with a bang and my hangover was legendary. So let’s see, back on Saturday I went back to the training center for my second day of dive school. Things went much better right from the start. I found a larger wet suit, larger BCD and larger weight belt. So I was much more comfortable getting into my gear and I didn’t have to keep messing with my weights every 10 seconds. My comfort lasted into the first time we went to the bottom of the pool. While everyone was doing skills I started to get panicy again and finally surfaced because of it. The dive master came up with me while everyone else stayed down to practice and he talked me down. It was something about just sitting there waiting for my turn that just got to me and I felt like my lungs were closing up. He consoled me and said he had similar problems when he started and we just chatted for a few minutes. A bit later the instructor came up and asked me if I was ready to try again and from there out everything went just fine. I completed all my skill checks and then we had some free time to swim around and practice anything we liked. I found that once I was on my own and able to just chill out and relax I did great. I went to the bottom and sat there for 10 minutes just working on slowing my breathing and it was all great. And that was it for the pool training! We went and had lunch, stopped by the pharmacy to get seasick pills, which the instructor recommended everyone get, then went to the dive store to get the hard sell on dive gear. No one really bought into it but it was temping to at least get my own mask and snorkel. I figured that I had already spent enough money on diving though, and I also didn’t want to add something else to my already stuffed backpack. 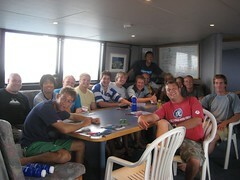 Then it was back to the training center for our last book lessons and instructions for Sunday, the first day on the boat! I got picked up for the boat at 6:15am to go to the dive store and get ready to leave. In theory. What actually happened was that I was told I would be picked up at 6:15am and the bus never came. At about 6:45 the instructor came walking over to the bus stop and said everyone was waiting for us at the dive store and what the hell were we doing? His impression was that he had told us we should walk over to the dive store at 6:15am but me and the other 4 people staying at my hostel remembered differently. Anyway, it all worked out. We walked over, dropped off some luggage and headed out to the boat! The boat was really, really nice. We met the crew, learned the rules and settled in for the 3 hour ride to the reef. We were headed for the outer reef which was about 40km out to sea. It was really neat. First time I’ve ever been out of sight of land and I really enjoyed it. Boat life was very nice, but anything but relaxed. The schedule each day was basically get up at the crack of dawn (or earlier), immediately dive (like within 15 minutes of waking up), breakfast, dive, morning tea, dive, lunch, dive, afternoon tea, dive, dinner, night dive. We newbies didn’t get to do each of those dives but the people on the trip who were already certified did. I did 2 dives on the first day, then 4 on the second day and 3 on the third day. 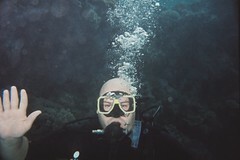 My first 4 dives (day one and two) were my open water training dives needed to complete my certification. The fourth one was really cool. We didn’t have much left to do in the way of skills so we did them and then Jay (our instructor) wrote “Congratulations! CERTIFIED!” on his slate and showed it to us. We all cheered and congratulated each other, as much as you can under 16 meters of water and then he let us loose for the last 15 minutes of the dive to explore on our own. The rest of the dives were our own. All you did was find your buddy (you always dive with a partner), get suited up and get in the water. You determined your path, time under and everything else, although Tanya (the dive supervisor) gave suggestions for seeing the coolest stuff. And there was cool stuff aplenty! Throughout my 9 total dives I: saw sharks, turtles, stingrays, a puffer fish, every kind of tropical fish imaginable, I found Nemo (everyone wants to find Nemo), picked up a giant sea cucumber and a pineapple sea cucumber, touched a weird sea anenome that stuck to my hands and nearly drowned myself mugging for a camera shot with my regulator out. All the dives went really well with no problems at all. I sucked a little more air than Dave (my buddy) so I usually forced us to the surface earlier than he would have had to, but not by much. 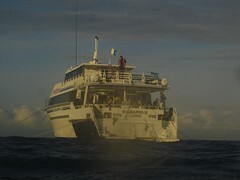 We averaged around 40 minutes per dive so all told I was under for a good 5 or 6 hours during the trip. The entire experience was completely wonderful! I had the best time diving, met a ton of great people, really enjoyed the boat and just had a blast. The food on the boat was awesome, and there was tons of it. 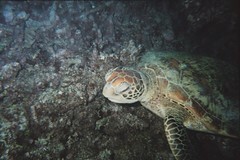 Diving is pretty strenuous, even though it doesn’t feel like it, and you have to keep your energy up. Eva, the ship’s cook, had something great to eat ready after every single dive and when she wasn’t cooking the next meal she was baking cakes to snack on. There was unlimited coffee, tea, water, bikkies (biscuits, or cookies to us) and as much of each meal you could stuff in. 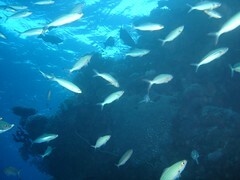 And that was my diving trip on The Great Barrier Reef! I’ll never forget it, or the hangover I had yesterday after our welcome back / goodbye party. At 7:30pm yesterday we were supposed to meet at Rattle and Hum to party it up with everyone from the boat. I strolled over, got myself a pitcher of Victoria Bitter and settled in for about the longest night of drinking of my life. One pitcher turned into three, shots were ordered, pints were drunk and everyone got along great. Eventually Rattle and Hum closed so the serious drinkers (myself included) headed to P.J. O’Briens to keep going. By that time everyone was buying everyone else drinks and we were all just drowning in it. There was Coyote Girls (I have no idea why they are called that, but they danced on the bar), and dancing and pictures and idiocy. Eventually that place closed so me and about 5 others continued on to The Woolshed. My memory gave out a little bit before that, so I am not sure on the details but I think we were denied entry for being too drunk and we all stood around in the square acting like idiots until we wandered off. Yesterday I had the worst hangover of my life. I only have a few memories from the morning. One is waking up to see the cleaning girls cleaning my room around me. I was wearing nothing but boxers and laying on top of the covers, so that was awesome. The next was at 1:30pm when I woke up and tried to get moving. I had to meet Dave downstairs at 2:00pm to get the results of our film pictures that he had got developed and then we went and tried to get some lunch down. We were both seriously hurting. Then it was back to bed till 9:30pm when I went out to find some dinner and upload pictures and then back to bed until 7am this morning. I’m feeling mostly better, but my left ear hurts. I think I have some water stuck in there or something. So now I am catching up on the Internets and I need to do a bit of shopping. It was raining when I came in the Internet cafe, but knowing the weather here it’s probably gorgeous and sunny now. Or possibly there’s a cyclone. So that’s it! I almost done with my time in Australia. I’ve had a heap of fun here and I’m about ready to move on. I am planning on stay on in Cairns for at least another week to just chill out and work on my tan and then I’ll be moving on to Christchurch, New Zealand! Dave is headed that way himself today so we may try to meet up in a few weeks and maybe even do some diving. Oh wow – your trip looks like a blast! Keep the pics coming! Utterly amazing dude. Lovin’ the blog & pics. Next Next post: One Month, and Indecision!